Every minute of your journey matters. So, when it’s time for you and your family to head down the road on yet another adventure, choose a vehicle that’s well-versed in every twist and turn of the terrain. And with the 2018 Jeep Grand Cherokee as your sidekick, you’ll meet every obstacle with expert handling, poised suspension, and potent performance. T o help you navigate the ins and outs of this road-coursing legend, we’re here with this Buyer’s Guide to the Jeep Grand Cherokee eBook. Within the pages of this guide, you’ll delve into all the information you need on this luxurious SUV. Thanks to this handbook, you’ll learn more about the following facts, all of which will get you more familiar with this road warrior. On top of that, this FREE eBook comes armed with a collection of convenient coupons that’ll save you some cash when you’re ready to purchase your next SUV. 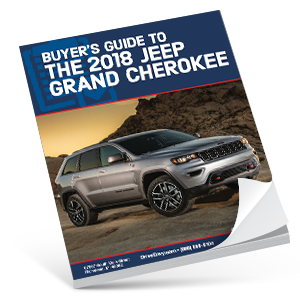 So, don’t hesitate—download your copy of this Buyer’s Guide to the 2018 Jeep Grand Cherokee so that you arrive at your dealership as a fully-informed expert. All you have to do is click on the link and start reading today!